I'll be keeping this list updated through the month of June so check back frequently! Friday, June 8, 1pm. Euro 2012 kicks off with Poland vs Greece and Russia vs Czech Republic. McGinty's will be showing all the games live downstairs and upstairs with their huge HD pull down screen. Friday, June 8, 6 - 9pm. Kick Off Silver Spring Blues Week at Pyramid Atlantic. Pyramid Atlantic Art Center will be gettin' that Blues Week party started. This event will feature cocktails, hors d'ouvres, art, and live Blues music featuring Silver Spring's Jonny Grave. Tickets are $10 in advance and $15 at the door. Friday, June 8 - Saturday, June 16. Related to the event listed above - Silver Spring's first ever Blues Week. During this week they expect to have lives Blues performances, food, and drink specials "throughout DTSS" as per the Silver Spring Blues site. However the only venues I saw mentioned are Fire Station 1 (but nothing about this is listed on their website), McGinty's (performance by Patty Reese Thursday night) and Zev's Coffee Cafe (mention of an acoustic performance). There are also plans to present Blues bands on Veteran's Plaza during the week. Saturday, June 9, 8pm. Luis Enrique at The Fillmore. Luis Enrique is big time throughout Latin America. He's a Nicaraguan salsa singer who received a Grammy for his album, Ciclos, for Best Tropical Latin Album. If you like salsa dancing, this is the place to be. Free parking in the nearby garages after 6pm. Saturday, June 9, 9:45pm. The Society Lounge to show the Pacquiao vs Bradley fight. Sunday, June 10, 1pm - 6pm. 3rd Annual Washington Revels SunFest: Music and Dance from around the World in Downtown Silver Spring. Their mission as per their website: "SunFest is a summer solstice celebration of world cultures hosted by Washington Revels. Designed to give both professional and non-professional performers and groups an opportunity to shine and share their cultures, the festival features traditional performing arts – music, dance, drama, and storytelling – from around the world, creating connections among diverse communities". They are still looking for volunteers. More details here: I wanna be involved in my community and volunteer!. They are also still looking for Performing Art Groups that represent African, Latino, Caribbean, Asian, American, & European heritages. More details here: I'm not afraid to get on a stage and shake it!. Saturday, June 16, 10am - 11pm. 4th Annual Silver Spring Blues Festival. There will be 2 stages of performers. Here are the details on schedule of performances. Celebrity Emcees include Ida Campbell, Host of "Don't Forget the Blues" on WPFW-FM and Cortney Hicks from Majic 102.3. Saturday, June 16th, starting at 10pm. After party from the Blues Festival at McGinty's. Sunday, June 17 11:00–12:00, Early Bird Admission $5.00 | 12:00–5:00, Regular Admission $2.00. DC Record Fair: Father's Day Edition at The Fillmore. The Vinyl District is hosting this awesome event alongside Som Records and DC Soul Recordings. As per their website, "This edition of the DC Record Fair will feature 40 vinyl vendors from up and down the East Coast, our patented line up of guest DJs spinning on the hour, local vintage clothing and handmade craft pop-up shops, and a screen printing station run by Pyramid Atlantic Art Center". They also made a note to point out that "The Bloody Mary bar remains a constant" (which personally, I'm excited about). Monday, June 18 - Sunday, June 24. The 10th Annual AFI-Discovery Channel Silverdocs documentary festival. Silverdocs is a 7 day festival featuring documentaries from around the world with 44 countries represented. This year they are featuring 118 films and they expect 27,000 festival attendees throughout the week. 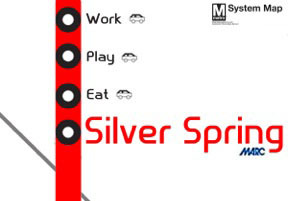 It will take place in and around Downtown Silver Spring. You can browse the movies and buy tickets HERE. The festival will open with Ramona Diaz's Don't Stop Believin': Everyman's Journey, also featured at the Tribeca Film Festival, is a fascinating documentary about Arnel Pineda, who went from Filipino You Tube sensation to lead singer of Journey. Big Easy Express - "Emmett Malloy follows bands Mumford & Sons, Edward Sharpe & The Magnetic Zeros and Old Crow Medicine Show"
Under African Skies - "Inspired by the unique rhythms and harmonies he [Paul Simon] was hearing from South Africa, Simon traveled there on a whim to record the album using local musicians"
Tchoupitoulas - "An impressionistic and dream-like journey through the nightlife of New Orleans"
June 18 - 22 - Metro Madness on the Red Line: Win $250 to Get Around Town - a chance to win hosted by MetroPointe Apartments. All you have to do to enter the sweeps is simply “like” the MetroPointe Page on Facebook and fill out their entry form to be entered to win either a $250 SmarTrip® Metro Card or a $250 Visa gift card. For the opportunity to win more entries in the sweepstakes, one should check their Facebook page every day during the week of June 18-22, 2012. They will be giving away clues about local businesses along the red line and everyone who answers the clue correctly for that day will receive one extra entry in the sweepstakes. Some of the local businesses being featured in the sweepstakes have partnered up with MetroPointe to add some extra goodies to the $250 grand prize. Know of an event I missed? Please hit me up here! Very cool! Lots of blues, love the documentary festival coming up. Nice! !